At the edge of the picturesque market town of Gorey and just minutes from Wexford's sandy beaches, this elegant 4-star hotel offers stylish and contemporary accommodations and superb facilities. The Ashdown Park Hotel has a peaceful and relaxing location, set in its own private grounds, just a short stroll from the town of Gorey and only a short distance from the area's sandy beaches and top-class golf courses. All of the hotel's 80 rooms are modern, but classical in style. Each of the comfortable and luxurious rooms is superbly furnished and tastefully designed. Food is served all day and live entertainment is offered throughout the week. 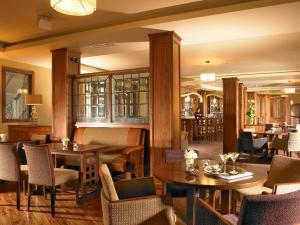 Dine in the award-winning Rowan Tree Restaurant or enjoy a light snack in the Ivy Bar. The impressive recreational facilities include a swimming pool, a children's pool, a jacuzzi, a sauna, and a steam room, as well as a beauty salon and kids' playroom. Set within 2 acres of gardens, the family-run Riverfield Farmhouse is on the banks of the River Inch. With free Wi-Fi throughout, it offers a children's play area, along with a tennis court and basketball court. With garden views, the bright and spacious rooms include a flat-screen TV, a private safe, and tea and coffee making facilities. 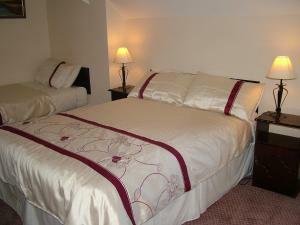 The rooms benefit from a hairdryer and an en suite bathroom. Ironing facilities are also available. Riverfield Farmhouse guests are greeted with complimentary refreshments upon arrival. In the mornings, guests can enjoy a full and varied breakfast menu, with homemade bread and preserves. Evening meals can be provided upon request. Any special dietary requirements can be catered for. The Riverfield Farmhouse is just 10 minutes' drive from white sandy beaches and scenic woodland walks. Glendalough and the Wicklow Mountains are just 30 minutes' drive away. Courtown Harbour is just 15 minutes' drive away and offers a swimming pool and a rock climbing adventure centre. 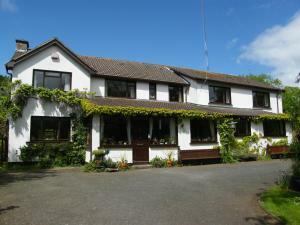 Providing a tennis court and free WiFi, Woodleigh Lodge features accommodation in Gorey. A flat-screen TV and DVD player are available in some units. A Full English/Irish breakfast is served daily at the property. If you would like to discover the area, cycling is possible in the surroundings. Wexford is 25.5 miles from the bed and breakfast, while Wicklow is 29.8 miles away. Waterford Airport is 60.3 miles from the property. With classic, elegant decor, this luxurious, 19th-century country house is set within 35 acres of grounds. 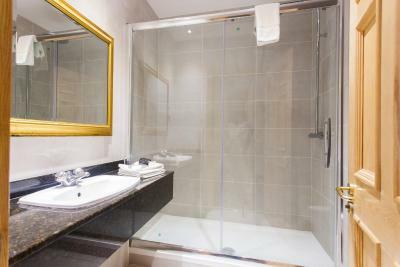 Its individually designed rooms boast marble bathrooms and cosy bathrobes. 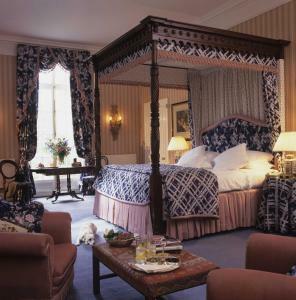 Furnished with unique antiques and paintings, each sumptuous room at Marfield House Hotel boasts luxury bed linen, fresh fruit, and complimentary mineral water. 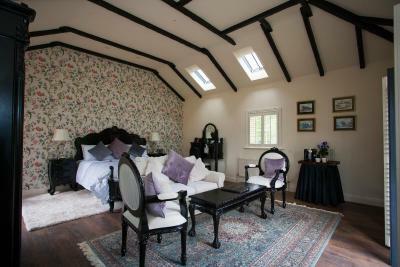 There is a TV/DVD player, luxury toiletries, and books and magazines for guests. With fresh, home-grown fruit, herbs, and vegetables, the restaurant serves classic cuisine with French and Mediterranean influences. Guests can dine in the spacious conservatory overlooking the beautiful gardens. 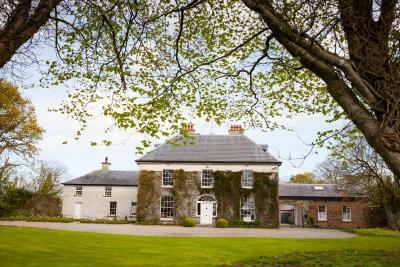 Free parking is available at the house, and horse riding along Wexford's scenic trails can be arranged by the hotel. There is a croquet lawn and a tennis court in Marfield's grounds, along with a lake with swans, ducks, and geese. Located less than an hour’s drive from Dublin, this hotel provides a luxury retreat away from the stresses of everyday life and is perfectly located for exploring south-east Ireland. 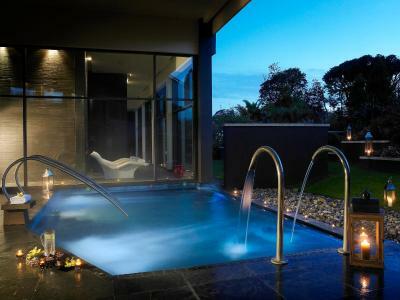 Seafield Hotel & Spa Resort is nestled in the midst of 160 acres of wooded park lands. Stroll the private riverside walk to the white sands of Ballymoney Beach with the dramatic backdrop of Tara Hill. Get pampered and lose yourself in our exquisite Oceo Spa or before sampling the gourmet culinary delights our restaurant has to offer. The hotel was designed by Italian architect, Francesco Beia, in a clean and contemporary style which maximises natural daylight and fully promotes the awe-inspiring sea views. Set in Gorey, Clonganny House offers accommodation with free WiFi and flat-screen TV, as well as a garden and a terrace. There is a private bathroom with shower in all units, along with free toiletries and a hair dryer. A continental breakfast is served every morning at the property. The in-house restaurant serves French cuisine. 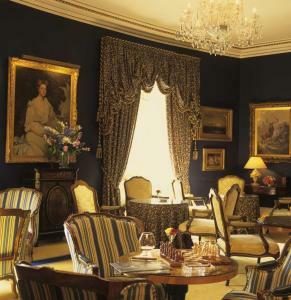 Wexford is 19.9 miles from the bed and breakfast, while Rosslare is 29.2 miles from the property. The nearest airport is Waterford Airport, 57.2 miles from Clonganny House. 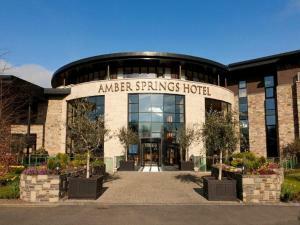 Situated just 10 minutes' walk from the town of Gorey, the family-run Amber Springs Hotel offers a bar, restaurant, and a spa. With free valet parking, it is just 13 minutes' drive from miles of sandy beaches. 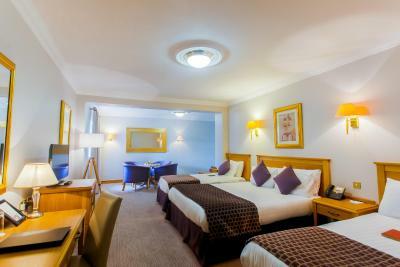 The spacious and contemporary rooms offer a TV and tea and coffee making facilities. 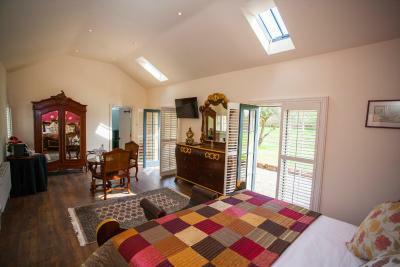 Each room benefits from an en suite bath or shower room with a hairdryer. Award-winning cuisine is available from Brookes Bar, Kelby's Bistro, and the Amber Springs Restaurant. Dishes are prepared using organic and locally sourced produce where possible, such as Angus beef. The Amber Springs Hotel offers numerous outdoor activities for children, including mini-golf, a playground, and go-karting. The indoor Playzone has a bouncy castle, ball pool, and games. Adults can enjoy beauty treatments in the Club Amber Springs Leisure Centre. 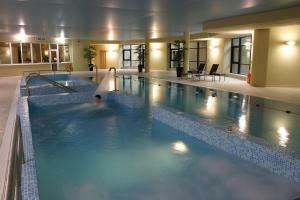 This also boasts an 18-metre swimming pool with an attached pool for kids, a sauna, hot tub, and a fitness studio. 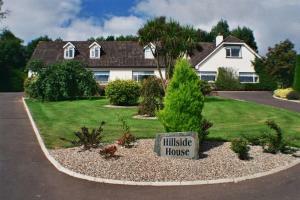 Just under 1 hour north of Wexford, Hillside House provides comfortable en suite accommodation in south east Ireland. 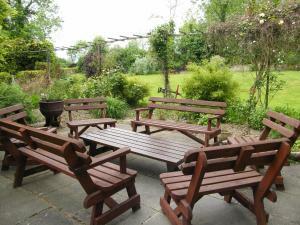 Around 12km from Courtown Harbour and 6km from Gorey, it has magnificent views, free parking and free Wi-Fi. 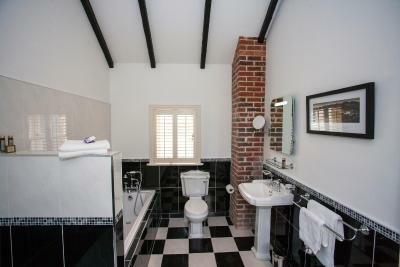 Each room has en suite bathroom facilities with bath or shower and complementary toiletries. All rooms have a TV, hairdryer and tea and coffee facilities. A full breakfast menu features a cooked Irish breakfast, smoked salmon and scrambled eggs, and French toast with maple syrup. There are cereals, yoghurts, cheeses and fruit juice, brown and white toast and fresh teas and coffee. The nearby town of Gorey has a range of cafés, pubs, shops and restaurants to explore, and the area offers scenic locations for angling, walking, golf and water-sports. Hillside House is around 80 minutes? drive from Dublin Airport.